I was approached by someone who wanted a particular, special present for his wife for their anniversary. 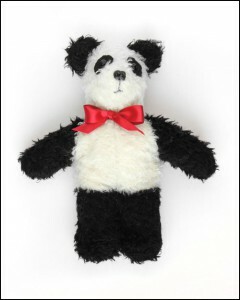 His wife had a panda bear when she was little and lost it many years ago. It was very special to her and he wanted to find her a replica. Unable to find one in the shops he approached Creative Threads to get one specially made. He send me as many details as possible about the size, look and feel of the bear so that I could get it just right. Getting the feel of the bear right was just as important as the look. I wanted to ensure that when she cuddled it, her happy childhood emotions would come back to her.